We’d love your help. Let us know what’s wrong with this preview of Doctor Who by Russell T. Davies. There are many hundreds of books about writing – some of them are very good indeed. When I taught creative writing at university, I used to wax lyrical about Stephen King’s On Writing, but also about E.M Forster’s Aspects of the Novel and Dorothea Brande’s Becoming a Writer. To that inestimable list I can now add The Writer’s Tale by Doctor Who head Russell T Davies. When this book first appeared in 2008, it was hailed as a masterpiece. Included in top ten lists at the end of the year, appearing There are many hundreds of books about writing – some of them are very good indeed. When I taught creative writing at university, I used to wax lyrical about Stephen King’s On Writing, but also about E.M Forster’s Aspects of the Novel and Dorothea Brande’s Becoming a Writer. To that inestimable list I can now add The Writer’s Tale by Doctor Who head Russell T Davies. When this book first appeared in 2008, it was hailed as a masterpiece. Included in top ten lists at the end of the year, appearing on Richard and Judy’s Book Club list and read by millions of Doctor Who fans, I was a little wary that it would be too populist, contain not nearly enough about the actual writing process. I did not buy it then. 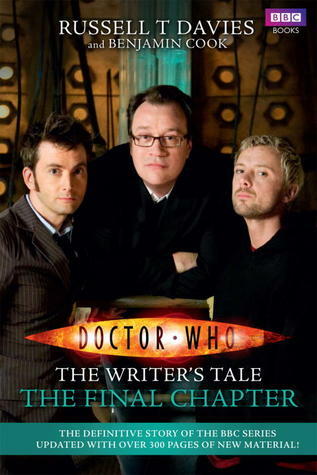 When Russell T Davies completed his final episodes for David Tennant, they updated the book, and it was declared even richer in content. Now I had to have a look. Constructed around an email correspondence between RTD (as he’s known) and Doctor Who Monthly editor Benjamin Cook – he requested RTD to deconstruct his writing process over the course of one episode that became a two year analysis in writing, living and thinking. That this is a book about Doctor Who is almost incidental: the lessons one can learn from this invaluable tome can be applied to any form of TV writing. As someone looking to begin a career in the BBC very soon, it has been an eye-opener and primer for what I can expect. It is also very, very funny. This was the biggest surprise – though it shouldn’t have been, for RTD’s scripts have always been funny (a small aside: I’ve followed RTD’s writing career since 1999 when Queer as Folk showed me that there was more to TV than the serial killer dramas and dull action movies my family thoroughly enjoyed. I think I enjoyed that show all the more as I had to watch it in secret, at two in the morning, and couldn’t talk to anybody about it as all my friends and family were/are homophobic and so I related to Nathan Malone and his journey, and boy did I laugh with them too) and this book is just as funny: his lift journey at the NT Awards with Liz Sladen and the rest made me buckle over with splitting sides. I'm a huge fan of Russell T. Davies' big, epic writing in the new Doctor Who, so as a writer I welcomed this chance to peek inside his head, through his email correspondence with journalist Benjamin Cook. What I found surprised me, enlivened me, heartened me; made me laugh and cry and say, "yes, I know that exactly!" He's candid, sordid, "big and blousy," and funny. He doesn't sugar coat things; many parts are painfully honest. But here unfolds the twin story of one of the most successful shows o I'm a huge fan of Russell T. Davies' big, epic writing in the new Doctor Who, so as a writer I welcomed this chance to peek inside his head, through his email correspondence with journalist Benjamin Cook. What I found surprised me, enlivened me, heartened me; made me laugh and cry and say, "yes, I know that exactly!" He's candid, sordid, "big and blousy," and funny. He doesn't sugar coat things; many parts are painfully honest. But here unfolds the twin story of one of the most successful shows of the decade and a while-I'm-writing journey of the man who made it happen. The book reads with all the nail-biting gusto of a good novel. It's a look at writing from a vantage seldom seen, from the writer's desk itself, where choices are made that effect, in Davies' case, literally millions. It's a story of what, and why, and sometimes how. It's a story of writing and life and just how much they're intertwined. Read this book if you are a writer. Read it if you're a Doctor Who fan, or just a science fiction fan in general. It's worth every page. This book is not for Doctor Who fans. I mean, it is. Of course it is. It's co-written by one of the great Doctor Who writers and a columnist for Doctor Who magazine, chronicling a three year period of making the show, and they constantly talk about the process of making Doctor Who. But really, this book isn't only (or even primarily) about Doctor Who. If you are interested in writing, or the writing process, this book is for you. If you're interested in the aesthetics and production of TV, too. In This book is not for Doctor Who fans. But really, this book isn't only (or even primarily) about Doctor Who. If you are interested in writing, or the writing process, this book is for you. If you're interested in the aesthetics and production of TV, too. In a nutshell, this book is about artists, and work, and self-doubt, and self-confidence, and actors, and producers, and fans, and fandom, and critics, and media, and journalists, and politics, and faith, and humor, and life. This book is a series of emails between Russel T. Davies and journalist Benjamin Cook. I found that disappointing at first, but most of the emails are long rants from Davies about what it is like to be a writer, so it isn't far from what a proper book from him might have been like. I think writers would get the most from this book, since the interesting tidbits on Doctor Who are few and far in between. This new edition contains 300 pages of new material, which mostly consist of Davies feeling str This book is a series of emails between Russel T. Davies and journalist Benjamin Cook. I found that disappointing at first, but most of the emails are long rants from Davies about what it is like to be a writer, so it isn't far from what a proper book from him might have been like. I think writers would get the most from this book, since the interesting tidbits on Doctor Who are few and far in between. This new edition contains 300 pages of new material, which mostly consist of Davies feeling stressed out and tired along with random chitchat between the two. There is more discussion on Doctor Who, but this is mostly Davies reporting ideas he had that we've since seen on screen. On his Who's Round podcast (in which he interviews various people who've been involved in Doctor Who over the years), Toby Hadoke got very annoyed with those listeners who only downloaded the episodes in which he interviewed Russell T Davies. I do feel for Hadoke but I understand why listeners reacted in that way: it's not just that Davies was far more notable a contributor than Geoffrey J. Cravat and most of the others Hadoke has interviewed (as showrunner from 2005 to 2010, he oversaw the se On his Who's Round podcast (in which he interviews various people who've been involved in Doctor Who over the years), Toby Hadoke got very annoyed with those listeners who only downloaded the episodes in which he interviewed Russell T Davies. I do feel for Hadoke but I understand why listeners reacted in that way: it's not just that Davies was far more notable a contributor than Geoffrey J. Cravat and most of the others Hadoke has interviewed (as showrunner from 2005 to 2010, he oversaw the series' revival and arguably most popular period), it's that he is also one of the. best. interviewees. out there. So The Writer's Tale, a record of the emails sent between Davies and journalist Benjamin Cook, over the latter years of Davies's time showrunning Doctor Who is a real treat. If you're a fan of the show there's all the behind the scenes gossip and factoids you could hope for (Dennis Hopper's abortive role in the 2007 Christmas special; Davies's original low-budget plan for David Tennant's finale; Penny Carter, the companion who wasn't) but the real joy of the book is getting 700 pages of Davies's thoughts on narrative, representation, the TV industry, and everything in between. Deliberately neither a behind the scenes guide nor an instruction manual on writing, it is a record of the process of writing as told from Davies's perspective. You don't have to agree with him, you don't have to emulate him, you don't even have to like him, but when you disagree, dissimulate or dislike it'll likely be in the understanding that it is Davies himself who has given you half the tools to argue against him. You may despair at his endless last-minute rushes to write his scripts, but it's because of him that you'll understand why that complicates matters and makes other people's lives more difficult. He's not short on self awareness. He's also very, very funny, which helps. Special shoutout also to interviewer and editor Benjamin Cook, who's the co-author of this book but too easily overlooked. He has an almost tabloid sensibility – but in this context that's actually a very, very good thing. So often in this correspondence he picks Davies up on points or off-hand comments that many would automatically shy away from out of politeness or fear of confrontation; Davies's reflection on his own grief at his mother's death is one of the most moving things I've read in a long time, and it's prompted by Cook asking him flat out why he's not come to terms with it. Writing, Davies says, is about hammering away at your brain until you find some form of words that feels true to life as you have lived it. This book, as much as his TV scripts, is an exercise in that. God I wish he would write a novel; it'd probably kill me. If you're a Doctor Who fan, this book is a no-brainer. If you've never even heard of a Dalek, but are interested in storytelling, put it at the top of your TBR pile. 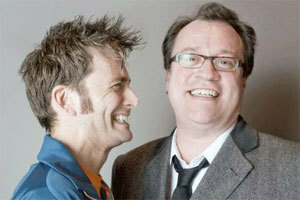 And always make time for a Russell T Davies interview. Okay, I'll be straight with you. If you're not a follower of the sci-fi/fantasy television series Doctor Who, there's probably little reason for you to read this book (or this review, for that matter). It's not just about Doctor Who, of course. It's about British television in the early part of the first decade of this century, and, above all, it's about writing, but to get to that, you 'll be wading up to your waist in Doctor Who and if you're not a Whovian, you'll just get lost, trust me. Russe Okay, I'll be straight with you. If you're not a follower of the sci-fi/fantasy television series Doctor Who, there's probably little reason for you to read this book (or this review, for that matter). It's not just about Doctor Who, of course. It's about British television in the early part of the first decade of this century, and, above all, it's about writing, but to get to that, you 'll be wading up to your waist in Doctor Who and if you're not a Whovian, you'll just get lost, trust me. Now, I wasn't crazy about those specials either. However, I can credit Davies with making me a New Whovian in the first place. Like many current female fan-girls, I came to DW after watching Tenth Doctor David Tennant in the saucy biopic Casanova, penned by Davies. My reaction at the time: "Hey...isn't David Tennant the new Doctor? Wait a minute...Russell T Davies wrote this? Didn't he write Bob and Rose ? He's writing the new Doctor Who too?!?" ...I became a prime candidate to read A Writer's Tale: The Final Chapter which covers the period when Davies began writing his final full season of Doctor Who while beginning a long, detailed and deliberate series of e-mails with Doctor Who Magazine writer and journalist Ben Cook. This gives fans of the show a peephole into the shadowland of roads not taken in character development, plot, casting, and special effects (usually the first to go to save money). For example, early on in the correspondence (back when it was going to be just a Doctor Who Magazine article and not a 600+ page tome), Davies describes his ideas for the Doctor's companion to follow Freema Agyeman's Martha Jones. (Again, if you're persisting in reading this and you're not a Whovian, you really should stop. Really.) He envisions an older woman in her thirties as a change to the twenty-somethings usually traveling through time and space with the quadricentenarian Doctor, a lady who has just been jilted by her fiancé. As these ideas are forming, news comes that Catherine Tate, who played one-off companion Donna Noble, will be returning for a whole season. Donna is thirty-something and has been jilted by her fiancé (who actually betrayed her before being fed to gigantic infant alien spiders), but now Davies must come up with a re-introduction, rather than an introduction. And you've got to hand it to him, this guy is bursting with ideas. I spent the book thinking: "Ooooh...that would have been nice..." or "Gee, I'm glad we were spared that..." It's probably the tantalizing promise of what a story could be and the the fear that it will fall short that results in what seems to be a lot of procrastination on Davies' part. I'm beginning to wonder if this is an essential part of writing, remembering the late Douglas Adam's classic line about loving deadlines and the "whooshing sound they make as they fly by". I certainly felt a pang of recognition myself, every time Davies confesses using up precious writing time doing unrelated work or watching television, even though I have neither Davies' talent nor the responsibility for the success of an iconic television show. Helen is in a delicate position in that she's only just started, and she's on the verge of being really very good - and now she finds herself ruined by this wall of hostility. It makes me furious. Now, I think both he and she are being a bit silly. Raynor's episodes were certainly not amongst my favourites, but apparently they were vastly popular so somebody must have like them. Davies claims you can't resist seeing what people are saying about you online. I say you can and you must and any DW writer who is misguided enough to venture on to a Doctor Who fan forum must be bonkers, anyway. It's like a fight club in there; I avoid forums on any topic like the plague. I do, however, engage happily in post-episode analyses of Doctor Who episodes on other people's blogs. I think it's one of the pleasures of being a fan. We certainly don't expect Mr Davies, Ms Raynor nor anyone else involved in the show to drop by, take our advice or get their feelings hurt. Most smart actors don't read reviews; smart writers should probably do the same. What did I learn from this book? I learned that Russell T Davies wrote not only his own episodes, but as the show's head writer re-wrote most of the episodes by other writers. Some evidently didn't mind and their comments on the process are included; a couple probably did. (I don't think Davies re-wrote episodes by Stephen Moffat who eventually took over the series from him.) Again, I was stunned by the quantity of ideas generated by this man; many of which were not used. "I only write to find out about myself, and I'll only achieve that if I'm honest." I'd always admired Davies. I was a big Doctor Who fan; while I enjoyed Moffit's tenure as show-runner, Davies will always be *my* writer (well...possibly him and Cartmel). But to get an inside glimpse of Davies' process...to have another writer, and a damn good one, talk about his struggles, his fears, his procrastinations--as well as his triumphs and successes...I just don't think there's another book on writing o "I only write to find out about myself, and I'll only achieve that if I'm honest." But to get an inside glimpse of Davies' process...to have another writer, and a damn good one, talk about his struggles, his fears, his procrastinations--as well as his triumphs and successes...I just don't think there's another book on writing out there that's nearly so reassuring, so validating, so RELIEVING as The Writer's Tale. I took months to read this. One month in, I found the courage to start putting some words of my own to paper. As I continue to write, I will probably continue to refer back to this book. It's the most quotable, candid discussion about writing, with none of the pretension of a book about "how to write." I absolutely loved this book. So much so, that I began rationing the final few chapters to make it last longer. It gives a real insight into the creative process of one of my favourite show. Its really dispels the myth of the professional writer, sitting down in their office at a set time and typing the whole day away. I love the fact that Russell T Davies appears to approach writing episodes in the same way I approached student essays, (minus the coffee and cigarettes). The idea that one of the I absolutely loved this book. So much so, that I began rationing the final few chapters to make it last longer. It gives a real insight into the creative process of one of my favourite show. Its really dispels the myth of the professional writer, sitting down in their office at a set time and typing the whole day away. I love the fact that Russell T Davies appears to approach writing episodes in the same way I approached student essays, (minus the coffee and cigarettes). The idea that one of the most successful writers on British television spends his time finding new ways to avoid writing and hoping that leaving it to the last minute will provide adrenaline fuelled inspiration is, (to use what appears to be his favourite word) a HOOT! Reading between the lines of the, no doubt highly edited correspondence, I get the sense however, that working with him as an executive producer was far from fun at times. He clearly doesn't suffer fools gladly ( his least favourite phrase) and you can see hints of the attitude that was rumoured to have Christopher Eccleston running for the hills after one series on the show. Benjamin Cook does his best not to come over as a complete fan boy, but fails spectacularly at times. Though his questions to Russell do become braver as the book progresses, clearly mirroring their working relationship. There is also a shift in tone in the later chapters. These were written after the publication of the original book and you can see that both writers are now acutely aware that they are writing for actual publication, even adding exposition emails to fill the gaps of conversations they've had in person. This makes it seem less personal than the majority of the book, but no less enjoyable. Reading the book so long after the event it covers adds a different dimension as well. We now know, just how well (or not?) Steven Moffat was, at taking over the series and its a little sad reading Davies excitement about moving to LA, knowing that before long, his partner's illness would have him returning to the UK. Two years worth of email correspondence between Doctor Who showrunner Russel T. Davies and some spod from Dr Who magazine, that ends up as a writing guide that's actually worth reading. These are dispatches that come direct from the front line of writing a hugely successful television show, and they trace many of Davies' ideas from formation to onscreen realisation, and give a great insight into the pressures, the panic and the immense workload that occasionally drove him to the edge of despair. Two years worth of email correspondence between Doctor Who showrunner Russel T. Davies and some spod from Dr Who magazine, that ends up as a writing guide that's actually worth reading. These are dispatches that come direct from the front line of writing a hugely successful television show, and they trace many of Davies' ideas from formation to onscreen realisation, and give a great insight into the pressures, the panic and the immense workload that occasionally drove him to the edge of despair. Towards the end of the book he writes about having caught a repeat of his episode The Sound of Drums on BBC3. "Was I on drugs when I wrote this?" he asks, echoing many who often critisised his style of writing for the show - often characterised as being brash, messy and unsubtle if not outright bonkers. I've been one of those critics, but, you know what, I take it all back. Actually, that's not entirely true, but I do have a new-found respect for the man after reading this book. For me, there's still too much running and shouting and exhausting mad energy in some - but by no means all - of his "big, blousy" episodes, but learning about the man's creative process and the sheer turnover of ideas has been revelatory. I've always liked Russell T Davies' writing - I've seen everything since Queer as Folk, and greatly enjoyed his Doctor Who novel Damaged Goods. I'm also a Who fan, so it probably wasn't hugely surprising that I was very very excited about the return of the series back in 2005. Luckily for me, I've generally enjoyed it, so I don't know why I didn't read the original version of this book - the idea of Davies writing about his writing process, and the production of such a successful show, wouldn't I've always liked Russell T Davies' writing - I've seen everything since Queer as Folk, and greatly enjoyed his Doctor Who novel Damaged Goods. I'm also a Who fan, so it probably wasn't hugely surprising that I was very very excited about the return of the series back in 2005. Luckily for me, I've generally enjoyed it, so I don't know why I didn't read the original version of this book - the idea of Davies writing about his writing process, and the production of such a successful show, wouldn't normally pass me by. Still, every cloud - when this greatly expanded edition came out, I remembered my failure to pick up the hardback, and had a go at this one instead. It's a fascinating read (well, if you like Doctor Who, or have an interest in the making of modern television), surprisingly honest and self-critical. I know some people don't like Davies' self-promotion and that he can sometimes come across as arrogant, but the version that appears here is very human, and very self-aware. A very brave decision to allow this to be published - I can only imagine what got left out! - and a deeply engaging, and intelligent, read. I loved this book. Consisting entirely of e-mails between Russell T. Davies (show-runner for the New Doctor Who Series through the first 4 seasons + year of specials) and Benjamin Cook (journalist from the Doctor Who Magazine), we given a behind the scenes look at how the last two years of Doctor Who (under Davies) came together. The most interesting aspect of the book is seeing how insecure Mr. Davies could be, despite the brilliant work he produced. He's also quite the procrastinator, something I loved this book. Consisting entirely of e-mails between Russell T. Davies (show-runner for the New Doctor Who Series through the first 4 seasons + year of specials) and Benjamin Cook (journalist from the Doctor Who Magazine), we given a behind the scenes look at how the last two years of Doctor Who (under Davies) came together. The most interesting aspect of the book is seeing how insecure Mr. Davies could be, despite the brilliant work he produced. He's also quite the procrastinator, something I could relate to a lot. I don't think everyone will love the book as much as I did...you really have to enjoy the behind the scenes look at the writing process. I'm sure some readers won't care about that...instead looking for juicy tidbits about the production (there are quite a few of those as well, but it isn't the bulk of this large book). The Writer's Tale is a must-read for any writers who want to know what it's like working on a huge television production like Doctor Who. The book consists almost exclusively of emails, particularly between Russell T. Davies (Dr Who show-runner 2005-2009) and Benjamin Cook (journalist from Doctor Who Magazine). These emails span around two years as the show hits its stride and finds itself central in the public eye, raising the stakes for all involved. As such, we see the inception of Davies' ep The Writer's Tale is a must-read for any writers who want to know what it's like working on a huge television production like Doctor Who. The book consists almost exclusively of emails, particularly between Russell T. Davies (Dr Who show-runner 2005-2009) and Benjamin Cook (journalist from Doctor Who Magazine). These emails span around two years as the show hits its stride and finds itself central in the public eye, raising the stakes for all involved. As such, we see the inception of Davies' episodes from Voyage of the Damned (Xmas 2007) all the way to the specials in 2009 when Russell makes his exit, along with much of the cast and crew. Measures have been put in place to make this book accessible to all, with handy episode keys and 'who's who' lists at the front ensuring even those who are unfamiliar with the show can pick it up and read without any confusion. Throughout the book, Ben asks a lot of questions about writing which prompt Russell into giving his insights and opinions, some of which the reader may agree with, others perhaps not. Russell emphasises that his approach is by no means 'the right approach' just the way that works for him. Yet this ongoing Q and A is unlikely to be what you'll remember the most from reading the book. Moreover you'll remember the fascinating details from all aspects of production. You will learn how budget and cast availability can shape story. You will learn what spoilers the crew fought tooth and nail to keep from the press (which is as entertaining when they fail as when they succeed). You will see behind the curtain to find out why writing can end up like cramming for Finals, and how this pressure cooker builds up and develops (and sometimes extinguishes) ideas conceived in a writer's mind. Illustrations and photo sections are a welcome accompaniment, bringing extra life to these funny and varied tales from the offices and on set. What strikes me about the book is how personal it is. Davies doesn't hold back in his emails, boldly announcing who he fancies in the business (which probably wouldn't fly in 2018), and offering intimate discussion on growing up as a gay man, as well as details on his mother's death. All of these stories create a vivid and rich picture of Davies as a person, which is ultimately why the book works so well. I'd say the book's biggest weakness is a lack of variety in its form. Centring the narrative around one email chain ('The Great Correspondence') can be fatiguing at times, and I found myself longing for more looks at other conversations and material between other departments, of which there is only a little. The love-hate relationship with the press being my favourite plot-thread, I would have really appreciated more images of the huge sensationalist headlines mentioned in the text as they wreak havoc for the BBC. Overall an enjoyable and immersive read. 4 stars. I think I like the first boom, A Writer's Tale" a little more than this second part. The Final Chapter occasionally felt self indulgent abs less about the writing process than the first part. Nevertheless with some brilliant moments of insight and greatness. The more I read the more I can't stand Benjamin Cooke, but RTD is often clever witty and intelligent which really is what's important about this book. I did find myself occasionally frustrated with how blind RTD could sometimes be to his own I think I like the first boom, A Writer's Tale" a little more than this second part. The Final Chapter occasionally felt self indulgent abs less about the writing process than the first part. Nevertheless with some brilliant moments of insight and greatness. I did find myself occasionally frustrated with how blind RTD could sometimes be to his own work. While I accept that people are different and see things differently and all that, it is frustrating that he thinks, for example, that one "selfish" line from Mickey is on anyway as bad or deserving of a repeatedly selfish as frankly obnoxious behaviour from Rose, that somehow that one line about his private emails justifies her behaviour towards him. Or that he calls the people who criticise him for mythicising the Doctor and making him a god like character, Dumboes because they can't see that he's actually saying the opposites in Rose, where he's trying to show that it's people who make gods and they don't really exist, yet not realise that in The Sound of Drums and Last of the Timelords he absolutely turn the Doctor into a god and Martha into Jesus. This is not the opinion of Dumboes, this is a sharp observation by many. As a Doctor Who fan and of the craft of writing, I was looking forward to reading this behind the scenes insight into writing and making the show. And it doesn't disappoint. The format is email correspondences spread over months and years between Russell T Davies and Benjamin Cook as Russell was making the show. And what is revealed is that writing and making Doctor Who is a seat-of-your-pants kinda experience. Everything comes at you fast, from every angle, and relentlessly. The demand to write As a Doctor Who fan and of the craft of writing, I was looking forward to reading this behind the scenes insight into writing and making the show. And it doesn't disappoint. The format is email correspondences spread over months and years between Russell T Davies and Benjamin Cook as Russell was making the show. And what is revealed is that writing and making Doctor Who is a seat-of-your-pants kinda experience. Everything comes at you fast, from every angle, and relentlessly. The demand to write, edit, edit other's work, produce, oversee, is remarkable. And the correlation between quality of an episode and how long or short a time it was written seems to be non-existent. The best book on writing. Period. When I first scanned through this book's sample to see if I'd like it, I was intrigued by the format. A TV writer and a journalist (in other words, two writers) bouncing emails about the process of writing back and forth? Oh, but if you take it at that value alone there's so much to be missed! If you're looking for a straightforward "how to write a hit television sci-fi show," you're not going to be happy. Nor is this about the philosophy of writing, of television, nor an exegesis on thee program When I first scanned through this book's sample to see if I'd like it, I was intrigued by the format. A TV writer and a journalist (in other words, two writers) bouncing emails about the process of writing back and forth? Oh, but if you take it at that value alone there's so much to be missed! If you're looking for a straightforward "how to write a hit television sci-fi show," you're not going to be happy. Nor is this about the philosophy of writing, of television, nor an exegesis on thee program, Doctor Who, itself. Charlotte Brontë said “I write because I cannot NOT write.” That's very much true here. This was a peek inside the head of the writer who brought back Doctor Who and made it a national treasure and a global phenomenon. But the key word here is "writer." With all the paralyzing self-doubts, conflicts, joyful inspirations, heady wee-hours-of-the-morning-last-minute inspirations, the last minute script changes and the entire kaleidoscopic, coffee-and-smokes-fueled emotional and mental sleigh-ride of writing the stories that drive a hit show of that magnitude. Day after day. Week after week. And because he was also showrunner, it also gives us an additional peek into making the really hard decisions that have to be made on every show, no matter how massively successful - or have to be made to KEEP a show massively successful. Benjamin Cook does a fine job of asking the questions I feel like *I* would have asked (but probably wouldn't be smart enough to ask if I had the chance) and sometimes chivies, sometimes even dares Davies to examine and answer. But there is the sense of underlying respect, writer to writer and man to man that underlies all the best friendships. It's like being able to read over each one's shoulder as they continue a two year long conversation. We know all the in-jokes and the short-hand references because these two have had us at their elbows the entire time, never excluding us, never talking either down to us nor over our heads as "fans" rather than as readers. Before I read this, I knew I liked Russell T. Davies' stories. I liked other shows he'd written (The Second Coming, Casanova, Queer as Folk) besides Doctor Who. After reading this book, I have a deeper appreciation for what goes into the making of a really fine television program, and I have an even deeper respect for the man who made that show happen. And more, he took on bringing back a show that had all the baggage of being an at-one-time childhood rite of passage (frequently made from behind the sofa, peeking through one's fingers). It takes brass as well as a surgeon's fine touch to resurrect a long-dead childhood dream. If you've enjoy Doctor Who since the reboot, you can thank Mr. Davies and his crew. Over the years that Davies was the head writer of Doctor Who, he emailed his friend and colleague Benjamin Cook (although exactly what he worked as escapes me). Now, every email over a two years have been published into book form, giving a behind-the-scenes look at the making of a show that's been watched by multiple generations. This book took me over a year to read. Not because it was boring, quite the opposite, but just because it was so big. An average 700-page book could probably be defeated by me in a week, if I was really trying. But this book isn't the kind of book to read through quickly, write a review and forget about. This is a book to savour. Now, I skipped loads of Doctor Who. I watched the first series (I still remember being at my dad's house, when he called me into the living room and said "Lucy, there's a show called Doctor Who starting, and we're all watching it. Okay? "), and possibly the second series, and then stopped for a while. I was 8/9 when it started, and it just scared me far too much (Victorian gas monsters, eurgh). I started again last year, but that still leaves me with a four/five series gap. Luckily, this book doesn't particularly require you to know much about Doctor Who. Most of any of the in-depth knowledge is all foot-noted or pushed into the extensive glossary in the back or in the long list of people in the front. All you really need to know is that there's a show called Doctor Who, it's a BBC sci-fi series and Russell T. Davies brought it back after a long time. Yet strangely, it isn't that much about Doctor Who. Sure, he talks about plans and scenes and things, but really it's just about the Joys of Being a Head Writer. It contains Davies' life in a lot of detail, what he watches, what he writes, who he meets, etc. A few pages of a script might wriggle it's way in, but mostly it's just one very long interview between Cook and Davies. And because of that it makes for excellent reading. It becomes very easy to put the book down for a few months and pick it up again, and you'll know exactly where you are. Each email is almost self-contained, as filming and writing schedules flick back and forth things need to be re-explained each time more for Davies' own benefit, as his life gets busier and busier. I wish they'd have issued the final chapter as a sequel in it's own book, rather than put the two together. The first original part is perfect and magnificent. I kept making highlights and sidenotes. Someone who has no clue of the show would probably be lost and bored, but it's enough to have seen most episodes and have a love or interest in writing to enjoy this. The final chapter part I'd say is only for actual fans of the show. We hardly get new insight into writing, it is much more about the I wish they'd have issued the final chapter as a sequel in it's own book, rather than put the two together. The final chapter part I'd say is only for actual fans of the show. We hardly get new insight into writing, it is much more about the behind the scenes of the production. We do follow the writing process, and for me it was interesting, but I couldn't really take anything from it the way I did with the first few chapters. At the start of the book, there is a warning that going through all those emails would make you not wanna be a writer, personally to me it made me not wanna "be" Russell T Davis. Instead of a new appreciation to him, I actually found myself liking him less and less as I progressed with the final chapter part. Davies and Cook exchanged emails and texts for the last two years of Davies' tenure as show-runner of Doctor Who (ie 2007-2009), so the narrative is spontaneous, spur of the moment, and feels very genuine (though of course the reader cannot know what has been edited out in the process). I had already read the first half, and Cook and Davies spend some time in the second half discussing the reception of the original version. Davies is perpetually struggling with deadlines, with his other responsibilities as showrunner, with his role as a public figure and spokesman not only for his own show but for his industry. The book offers insights into the process of writing, crafting and drafting, trying to get it right, over the period of weeks and months of producing Doctor Who. Occasionally one can trace particular elements to the outside world: Ben Cook, normally a passionate but detached observer, persuades Davies not to end Journey's End with a Cyberman teaser for The Next Doctor. But more often the writers are drawing on their own emotional resources and imagination, trying as it were to find the story that is trying to get out - there is a nice moment when Davies, emailing Cook, suddenly realises that Wilf Mott should be the instrument of the Tenth Doctor's demise. Structured as a dialogue between two writers, with lots of pretty pictures and extra amaterial, it is also about a success: whether or not one is a fan of Who or of Davies' treatment of it, the fact is that he revived a faded franchise and made it a hit, and that in itself is a good story even if we are only getting the final years. I commented about the first edition that there were a lot of deaths in it; there is only one in the second half, but it is significant - the mother of the Executive Producer, Julie Gardner, of the same illness which Davies' own mother had succumbed to a few years earlier. While of course all authors draw on many life experiences, it's not too fanciful, I think, to see a direct link between this and the creation of the Claire Bloom character in The End of Time, who in Davies' mind is very explicitly the Doctor's own mother. I am worried this will turn into just a gushing session, so I apologise in advance. This book is definitely my favourite book I've read this year so far, I found the entire thing so enjoyable to read and incredibly hard to put down. This is probably the most honest book I've ever read. I've read quite a few autobiographies, but none of those have ever made me feel like I really understand the person I'm reading about, and this isn't even really an autobiography. Russell T Davies seemed to pour I am worried this will turn into just a gushing session, so I apologise in advance. This book is definitely my favourite book I've read this year so far, I found the entire thing so enjoyable to read and incredibly hard to put down. This is probably the most honest book I've ever read. I've read quite a few autobiographies, but none of those have ever made me feel like I really understand the person I'm reading about, and this isn't even really an autobiography. Russell T Davies seemed to pour himself entirely into the emails, and whilst some people were probably annoyed by the constant complaining, I liked it because it showed that writing isn't all sunshine and rainbows. A majority of this book contains emails between Russell T. Davies and Benjamin Cook about the writing of series 4 of Doctor Who . I knew of both Davies and Cook before reading this, Davies obviously from writing Doctor Who and more recently Cucumber , and Cook from such works as Becoming YouTube , so knowing of both writers made me feel more connected to this book, and I probably wouldn't have picked this up if it had just been Davies and any old journalist. Whilst Davies contributes the most to this book with his long responses, Cook asks the thought provoking questions to elicit those fantastic responses. It was exciting reading this and knowing where his writing was going to go. He would be discussing how to make something work in an episode script, and I got to sit there with the answer he was so desperately looking for, and then watch as he figured out how to get to that answer. I loved learning about the amount of work that goes into Doctor Who and I am excited to watch series 4 again having read the book, I imagine it might make it a different experience. This is a book where I couldn't mark specific pages to return to later, because every page was brilliant and I just want to go back and re-read the entire thing. I don't think you have to be a fan of Doctor Who to read this, if you have a strong enough interest in writing this book is a great way to look at one persons approach to writing, I haven't ever seen Queer as Folk and I didn't feel too lost when they began discussing that, but who knows? If you love Doctor Who, if you love writing - this is The Book. First off, "The Final Chapter" is more like "The Full Tale". This isn't simply a reprint of "The Writer's Tale" with some extra chapters, it is literally twice the book. Russell T. Davies has been incredibly open with his correspondence and, whether you like what he's written or not, you have to admire him for that. The fact is he's made the Doctor Who revival into a huge commercial success. I don't always like the direction the show has taken but I'd still call Russell T. Davies a genius for wha First off, "The Final Chapter" is more like "The Full Tale". This isn't simply a reprint of "The Writer's Tale" with some extra chapters, it is literally twice the book. Russell T. Davies has been incredibly open with his correspondence and, whether you like what he's written or not, you have to admire him for that. The fact is he's made the Doctor Who revival into a huge commercial success. I don't always like the direction the show has taken but I'd still call Russell T. Davies a genius for what he's achieved. There is never likely to be another book quite like this. This isn't just a script writer sitting down and writing a book about 'how to be a writer'. This is a person opening up their personal correspondence to let readers into the private panic filled world of script deadlines and dilemmas. Benjamin Cook does an excellent job of putting in real-person questions about how it feels to be over-budget, stuck for an ending, spilt between two storylines. He also keeps it human and flowing rather than a question and answer session. Needless to say, fans of Doctor Who will want to read this is they have any interest at all in how the show is actually put together. It's a lot more disorganised than you'd think. This book is beautifully lay out though and the glossy pictures are wonderful. Most people would probably assume writers have a fairly relaxed life, even those writing for TV deadlines. This Great Correspondence shows us a fraction of the chaos that surrounds a show like Dr Who. It's a wonder the show manages to be produced at all when you read through the work that goes into it, never mind being made to such a high standard. It's an absolute privilege and courageous insight into the way he thinks and how plots for the show are brought into being. Some of the e-mails give a tingle of excitement as you recognise the familiar stories almost being born in front of you. This is marketed as a book on writing, like Stephen King's On Writing, and I suppose that is true. However, I didn't find this book about that so much as it was about the duties of a show-runner relaying all that goes into making a successful science fiction show work. In that regard the book is awesome. There are some really insightful tidbits that are found in this book that Russell Davies reveals about Doctor Who. Things I didn't even think I wanted to know. Just riveting stuff. However, at 7 This is marketed as a book on writing, like Stephen King's On Writing, and I suppose that is true. However, I didn't find this book about that so much as it was about the duties of a show-runner relaying all that goes into making a successful science fiction show work. In that regard the book is awesome. There are some really insightful tidbits that are found in this book that Russell Davies reveals about Doctor Who. Things I didn't even think I wanted to know. Just riveting stuff. However, at 700 pages there is a bit of bloat here too. It makes sense when you consider the premise of the book, which is a collection of all the emails between Russell T Davies and Benjamin Cook (journalist) over the span of two years. Depending on what was happening at the time (like say the casting of Donna Noble) the emails are fascinating, but then there are lulls too. Also, this book is RTD on paper, and that could get tiresome too. There is a lot of "Woe is the pain of being a writer" here, which is counter-balanced by Cook saying how amazing the latest script pages are -- with RTD agreeing of course. This book is an absolutely fascinating background story of the making of the fourth season/specials of new Doctor Who from showrunner Russell T. Davies. It's told through a series of emails and text messages between Davies and Doctor Who Magazine writer Benjamin Cook. The exchanges are for the most part incredibly compelling, and I spent more than one night pushing off bedtime so that I could keep reading more. At times I could tell chunks of email between the two had been cut out for length, bu This book is an absolutely fascinating background story of the making of the fourth season/specials of new Doctor Who from showrunner Russell T. Davies. It's told through a series of emails and text messages between Davies and Doctor Who Magazine writer Benjamin Cook. The exchanges are for the most part incredibly compelling, and I spent more than one night pushing off bedtime so that I could keep reading more. At times I could tell chunks of email between the two had been cut out for length, but for the most part the whole package made sense. It is a bit of a slog at times, as the book is just huge and detailed (and I wasn't particularly invested in seeing the original screen plays), but the burning desire to know it all just kept me going. There are also a number of truly priceless quotes about writing, it's meaning and Doctor Who under Davies. As a Doctor Who fan, I really enjoyed the book. As a writer who has a joke of him having the middle name of "Television" this book pro As a Doctor Who fan, I really enjoyed the book. As a writer who has a joke of him having the middle name of "Television" this book provides an insight as to why some parts of fandom have nicknamed this. Parts of me agree with him having this nickname, but then you see parts of him as a fanboy coming through and you can't help but thinking "best person ever for bringing back Who!" As a read, it's a page turning one where you can't help but keep reading and not wanting it to end. If you're a whoovian you'll love this book- if not as a read it provides a fascinating read as to the mind of a modern television writer who is (rightfully) applauded. 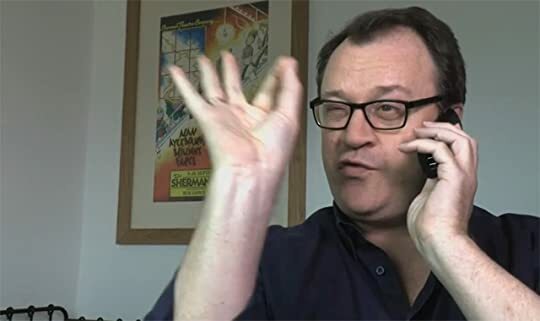 Russell T Davies, OBE, is a Welsh television producer and writer. He is a prolific writer, best known for controversial drama serials such as Queer as Folk and The Second Coming, and for spearheading the revival of the popular science-fiction television series Doctor Who, and creating its spin-off series Torchwood. Both are largely filmed in Cardiff and the latter is set there.